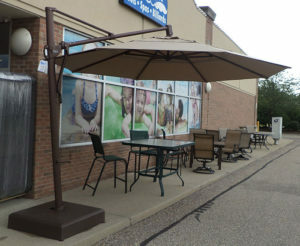 Patio Umbrellas Are Available From Sunny's Pools and More! At Sunny’s Pools and More, we carry an extensive line of patio umbrellas. Nothing provides quality shade for you to enjoy your new patio furniture quite like a good umbrella. Also, we carry all the top brands like Treasure Garden and can answer any questions you have about patio furniture or patio umbrellas. We have umbrellas that stand alone or ones that go with a patio table, visit our experts today to find out which one is best for you. No matter what color umbrella you are looking for, we have it. With sturdy construction and quality parts, our umbrellas will last you for years to come. Treasure Garden is one of the biggest manufacturers of patio umbrellas today. They have been producing quality umbrellas for over 30 years, and we highly recommend them. A Treasure Garden umbrella offers great heat protection from the summer sun. The shade from an umbrella can make the temperature anywhere from 15 to 20 degrees cooler. Other features of these great patio umbrellas are the modern style with the built in tilt feature. This lets you angle your umbrella to provide shade any time of day. The umbrella frames are made of aluminum instead of wood, to add to the lifespan of the umbrella. Also, the umbrella canopy can be removed for easy machine washing. In addition, each umbrella has built in wind vents to prevent it from blowing away in a large wind gust. Treasure Garden umbrellas come with a warranty as well. One or two year warranty depending on the umbrella. Wind damaged is not covered under the warranty. The Treasure Garden umbrella is built to last, with cords made from Kevlar material to extruded aluminum frames making them 20% stronger than most other umbrellas. Also, the canopies are sewn with a double overlock stitch to prevent the seam from separating. Maintenance tip from our experts, clean dirt, and soil from the umbrella canopy and frame from time to time. Make sure the canopy is completely dry before storing for the winter. Also, always keep the umbrella in the closed position when not in use. By following these simple tips you can extend the life of your umbrella. Sunbrella is one of the finest outdoor acrylic fabrics in the industry. The umbrella fabric is designed to be stain and soil resistant. Treasure Garden offers over 120 of these fabrics. 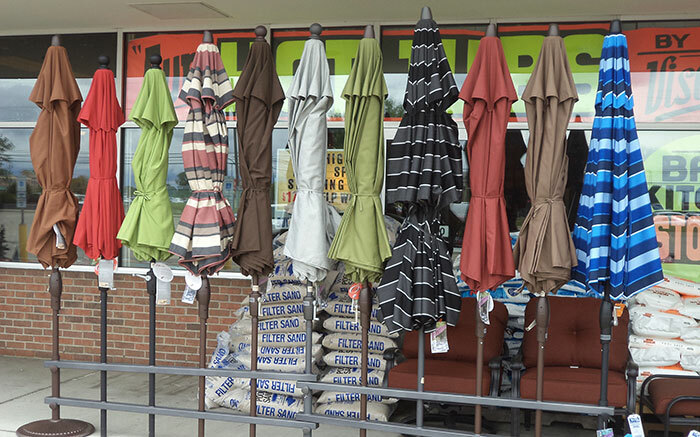 Not only are Sunbrella fabrics used for umbrellas, but they are also used for car tops, boat covers, and awnings. The fabric can be washed in a machine with cold water only. Along with Sunbrella fabric, Treasure Garden offers the O’bravia and the Solefin fabrics as well. There all types of fabrics and features you can choose from when purchasing an umbrella. One of the types of umbrellas to choose from is the Push Button Tilt. This is a manually operated title feature that is available in 9′, 7.5′ and 6′ models. The next type is the Auto Title. The tilt is controlled from the crank handle of the umbrella and has a variety of title positions. Finally, the last model is the Deluxe Collar Title. This model has a collar above the crank that you simply twist to position the umbrella. Built with a heavy-duty spring mechanism and reduces tension on the cord. As you can see there are all types of umbrellas and colors to choose from. Contact Sunny’s today for more information about your next patio umbrella.